Charlie and AJ’s Moroccan wedding at Villa Taj Marrakech was essentially a masterclass in maximalism! There were vases of every shape and size, Moroccan rugs covering the ground, fairy lights galore, embroidery hoops and macrame in every nook, and dried flowers mixed with pampas grass filling all the empty space. 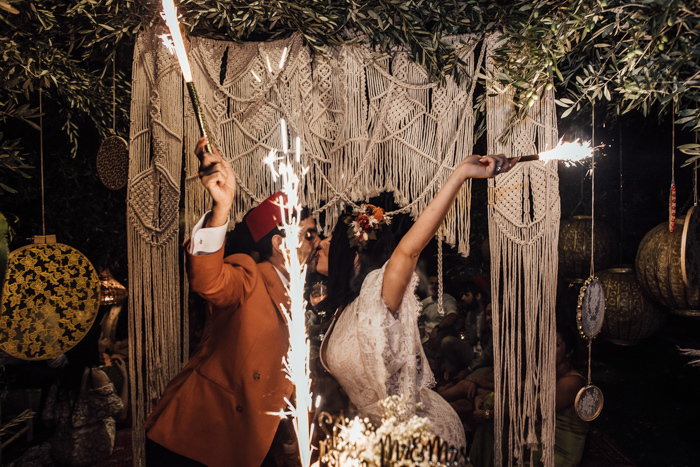 This talented bride and her dream team of vendors made all our Moroccan wedding dreams come true, balancing the subtle art of over-the-top decor while still feeling classy and curated – let’s take a look! There were lots of little touches to personalize the ceremony, from DIY decorations, their friend Leo marrying them, and their personal vows. The couple’s friends were also in charge of the music and we had home-made fans featuring the day’s program. The couple decided on everyone having a traditional Moroccan fez hat on their plate which was fun, great for photos but also a little keep safe for everyone. Adhering to Moroccan tradition under each hat was a small personalized bottle of rose water for guests to wash their hands before eating. The post Spectacular Moroccan Wedding Featuring Maximalism Trend appeared first on Weddingomania.